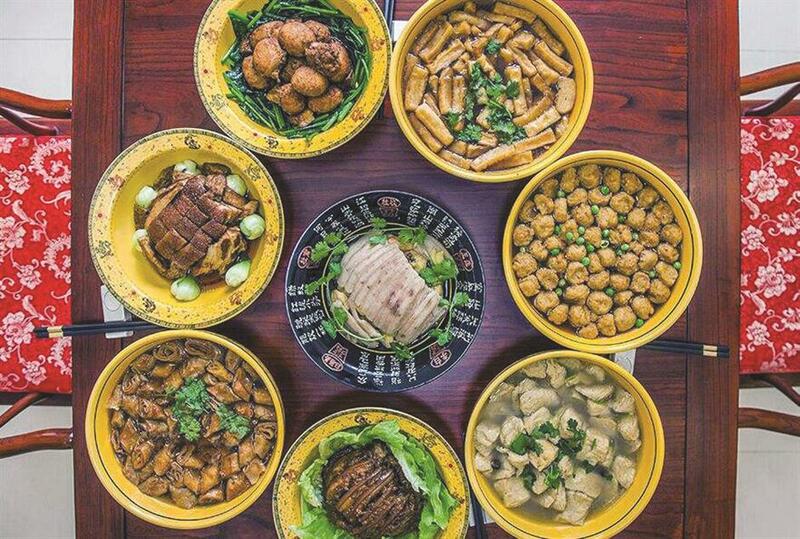 The old eight dishes of Songjiang District have evolved into unique and precious cuisines characteristic of rural Shanghai. “The traditional ‘old eight dishes’ refer to black fungus and carp jelly, casserole of three delicacies, garlic egg crepe, mold tri-color soup, gluten filled with meat, bacon and dried bamboo shoots, egg rolls and fried boiled pork,” said Dai Chunhui, chief of Yunjian Old Eight Dishes restaurant on Huancheng Road. Songjiang is a rich and populous place with fertile land and plenty of water and its old eight dishes have thousands of years of history. The ingredients are often organic vegetables and fruit from farmers’ gardens, wild river fish and shrimp caught nearby and chicken and ducks bred at farmers’ own houses. “The food of the ‘old eight dishes’ was an open-minded selection of a variety of ingredients by forefathers in Shanghai. They also reflect the dining culture of weddings and funerals in Shanghai,” said Dai. As the old eight dishes evolve with time, they can also include wooden cask boiled goat meat of Zhangze Town and spring fish of Huangshan Mountain. The former is boiled in a primitive wooden cask and the chef has to pay particular attention to controlling the heat while cooking the dish. The latter is rich in nutrients such as amino and unsaturated acids and selenium.